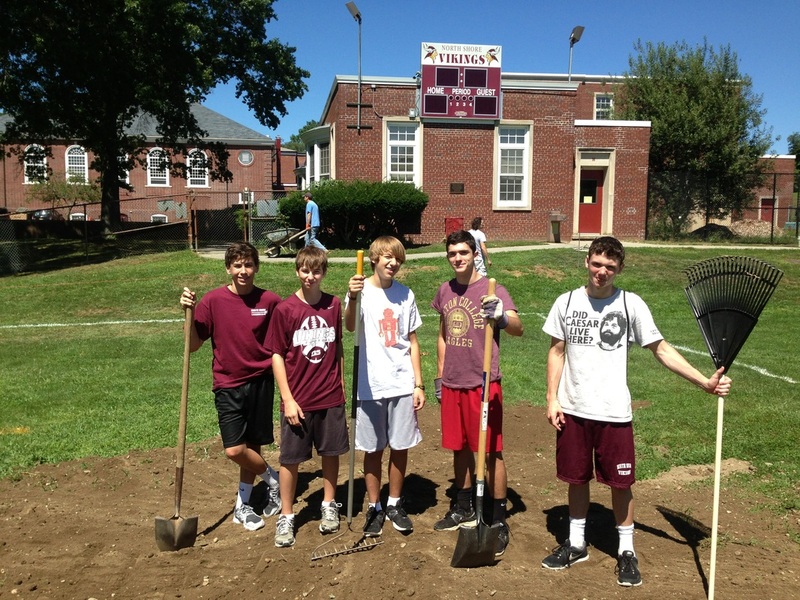 Sept. 6 -- Dozens of volunteers from the North Shore Lacrosse Club spent the last weekend of August refurbishing the two lacrosse fields at Glenwood Landing School that had been beaten up by the wear and tear of nearly year round use. The project, coordinated by Matthew Nizich, President of the North Shore Lacrosse Club, and the NSLC Board, along with the guiding hand of North Shore Schools Athletic Director Don Lang, was made possible by the generosity of Eugene Alletto, a North Shore parent and Lacrosse Club director who donated funds for the renovation, and of local businesses and residents who contributed materials, equipment, time and effort. 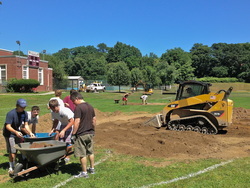 Dave Johanson donated soil; Peter Fischetti seed; heavy machinery and expertise were contributed by Lou Recine; and top soil and fertilizer by the North Shore Lacrosse Club and Giordano’s nursery. Labor was provided by NSLC board members, the Junior Officer Corps of the NSLC, members of North Shore PAL, and parents from the district. In addition to the field repairs, nets were added to the end lines to protect spectators from off the mark shots, keep play moving, and minimize the loss of balls.